We are incredibly proud to announce that Dr. Jon has been recognized as “Doctor of the Year” in the latest issue of Orlando Style Magazine! This is particularly exciting because the honor is bestowed upon the doctor who receives the most votes from readers. Each year, Orlando Style Magazine conducts an online poll and then tallies the results to determine who in our area will be named “Doctor of the Year.” Accompanying the recognition of our board-certified plastic surgeon as the winner is an in-depth profile chronicling Dr. Jon’s life from childhood to the present, recounting some of the major events that led him toward embracing a career in plastic surgery and opening the Aesthetic Surgery Center in 1997. 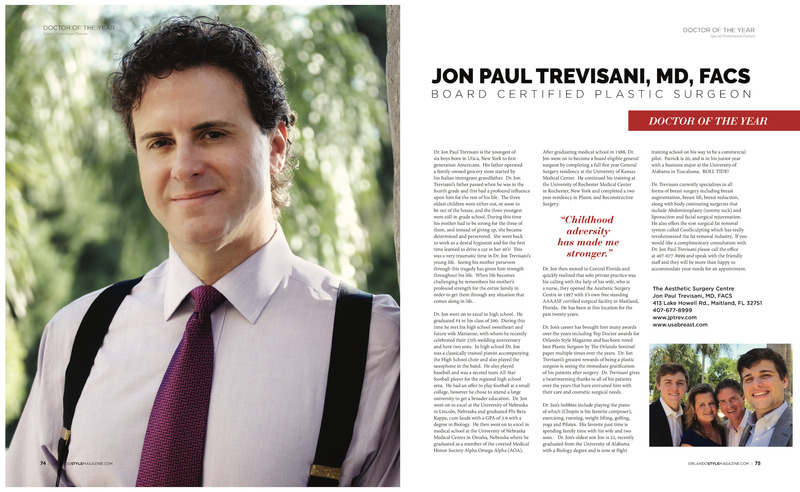 Dr. Jon has been recognized in Orlando Style Magazine before; however, this is the first time he has been named “Doctor of the Year,” and he couldn’t be more thrilled. He offers his heartfelt thanks to all those who voted for him, and still maintains that his greatest reward is seeing the satisfaction of his patients after helping them fulfill their aesthetic enhancement goals. Please contact us today if you would like more information on the treatments we offer, or if you would like to set up a consultation with Dr. Jon.